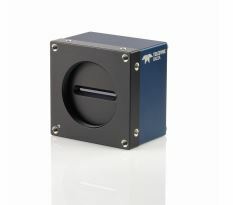 The new Piranha4 quadlinear RGB + NIR / Mono cameras provide industry leading speeds to meet future requirements of higher throughput in multi-spectral imaging applications. Based on Teledyne DALSA’s unique CMOS linescan technology, the Piranha4 multi-spectral camera delivers superb color plus near-infrared (NIR) fidelity, spectrally independent outputs, all in a compact footprint and with an easy to use interface. New features include multiple regions of interest for data reduction and regional calibration, sub-pixel spatial correction, white balance and color calibration tools.